Home Clouds 25 Adorable Animals Eating Food Like You Do On A Cheat Day. #6. It's Halloween season, which probably means pumpkins are decorating every corner of your yard. But if one day you wake up to some of them missing, don't blame your pesky next-door neighbors. There may be a pretty weird explanation for it! It's like a scene straight out of Disney! Whoever was taking this picture probably felt like belting out a tune or two, a la Snow White! #8. 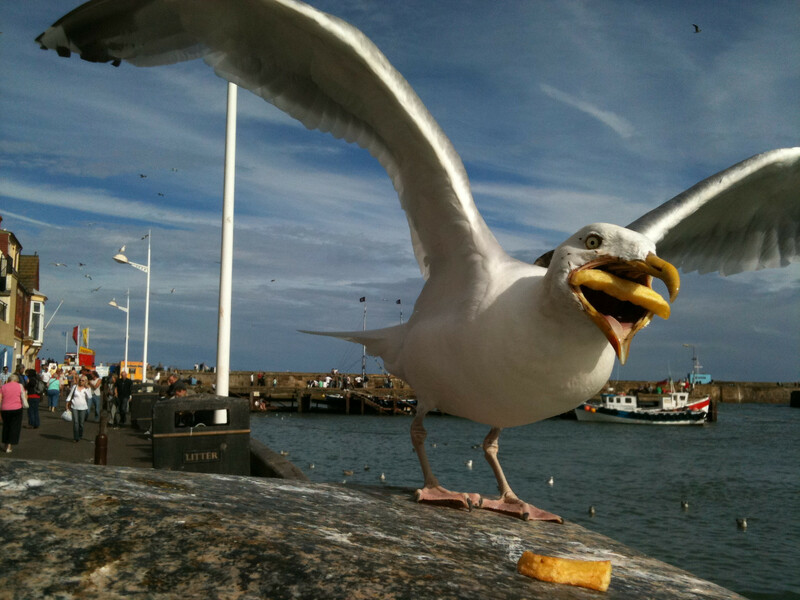 Here's a happy seagull who can barely fit a French fry in his mouth. This pic is so confusing! If no one told us that he was eating a strawberry, our minds would've gone down the gutter. Phew! He's a foodie and he's not ashamed of it! This hamster buried himself in spaghetti and he's not coming out until he munches on every last bit. And you know what? We can't blame him! #11. That awkward moment when you get put on a diet without so much as a head's up. Someone could've told this cat that his overindulging days were over. Look at his face! The betrayal is real, kitty. We feel it too! So you may have been fired from your job, but nothing can bring you down. Why? Because there's a big slice of pepperoni pizza waiting for you at home. Pizza will always have your back, baby! You can coat broccoli or peas with chocolate, and kids will still know it's a darn vegetable. They have a sixth sense! But if you're going to commit carbicide, at least choose something you enjoy eating so much, that you won't regret it later on. Just look at his eyes! 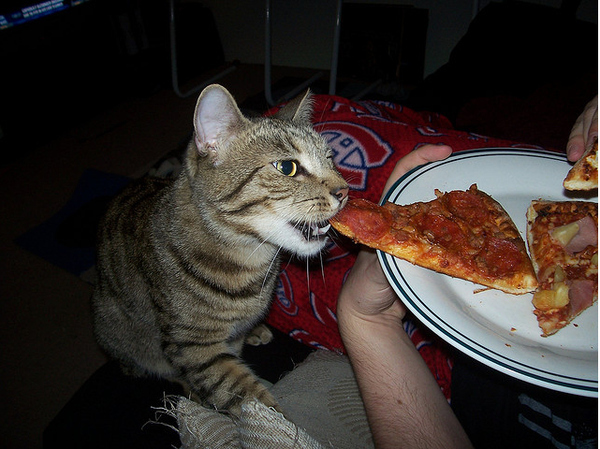 It's like he can't believe he's getting a huge slice! #16. That awkward moment when you just finished eating the entire ice cream container and someone asks if there's anything left. #18. We're not sure what this snail is eating but he's kind of cute! Out of all the things this doggy could like, he choose broccoli! Now that's a health conscious pup! But you only live once, and this cat knows it! Heck! He's even found a way to keep a nice treat near him at all times, just in case he's craving some. Yolo! #21. Passion doesn't even begin to describe how this doggy feels about ice cream! #22. Here's a chipmunk trying to shove as many peanuts in his mouth as he can. #23. You don't need to be Sherlock Homes to find out who ate the last bit of ice cream in this house. But you'll probably have a hard time putting this pup in timeout if you stare directly into those adorable puppy eyes. #24. You know the expression, "sink your teeth into something?" Well how about "sink your face, paws, and belly into milk?" If anyone ever asks if cats actually like milk, show them this pic and tell them, "I don't know, you tell me!" #25. Nutritionists suggest "eating like a bird" as often as 6 times a day, but always minding your portions. We could take a few notes from this little fellow, and start gobbling on our food as slowly as he does. Maybe that's the secret to staying as light as a feather! Just like humans there is always chowtime in the animal kingdom, and while some creatures just devour whatever they kill, others take a little more time to prepare a meal. In fact, some of their routines are very similar to the cooking techniques humans use. Here below we have collected some adorable photos of animals enjoying their food. From a tiny hamster nomming on some carrot as he cuddles on a blanket, to a squirrel getting its cheeks full while eating an entire corn, these pictures of animals eating are so incredibly funny and cute that we can’t help but giggle while looking at them. Previous articleJapan's One-Armed Violinist Will Inspire You To Chase Your Dreams. Next articleVirginia Man Hated Traffic Near His Home, So He Designed The Perfect Revenge.